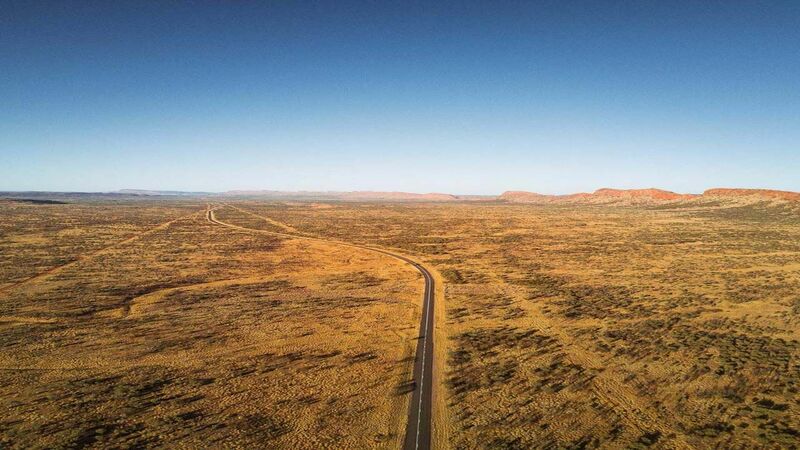 For some, the Outback means emptiness. And while the Outback is huge, I found it to be anything but empty. It was full of history, culture, geology, proud people — and adventures. 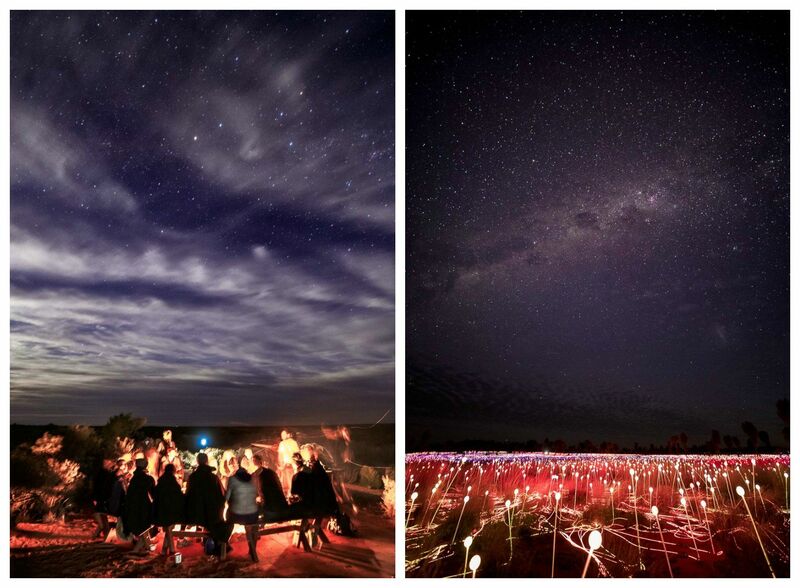 I spent three days in the Outback, but I would have stayed for weeks. 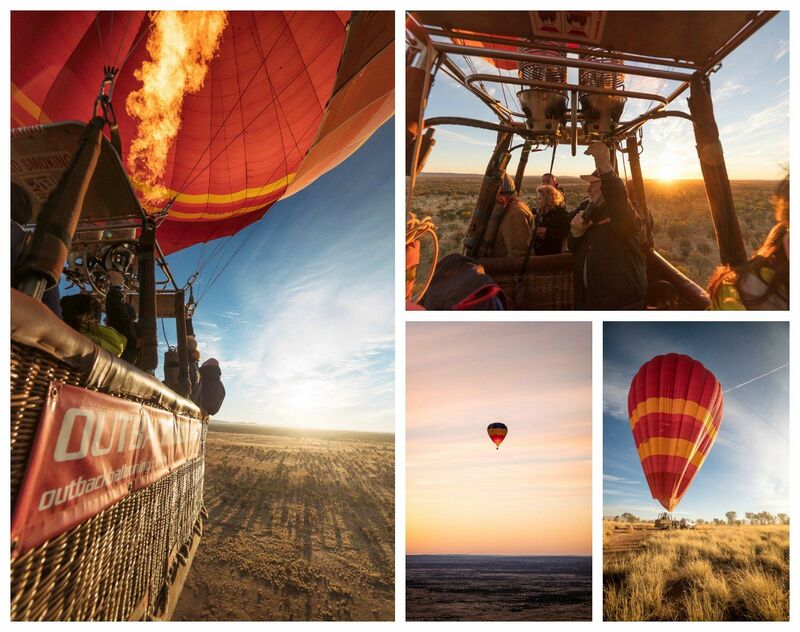 Here’s a span of 24 hours of adventure, from sunrise to sunset. 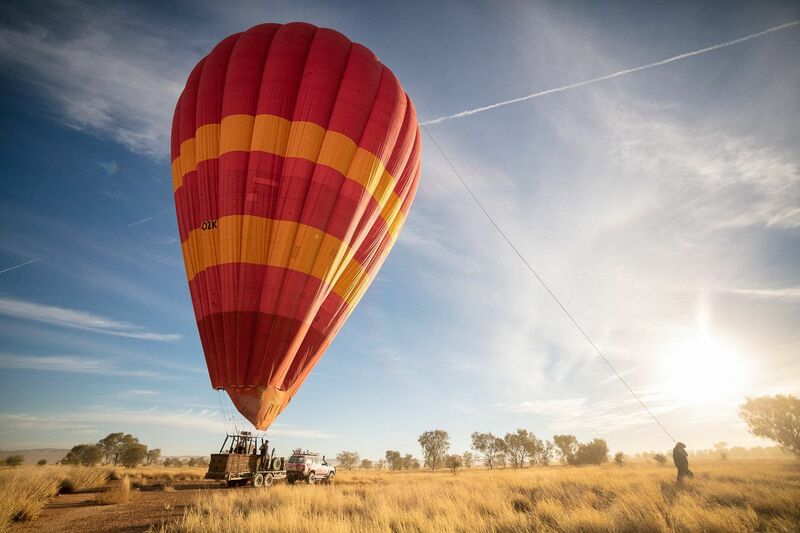 I began my journey at dawn, when the staff at Outback Ballooning greeted me and prepared me to launch thousands of feet above Alice Springs in the Northern Territory. 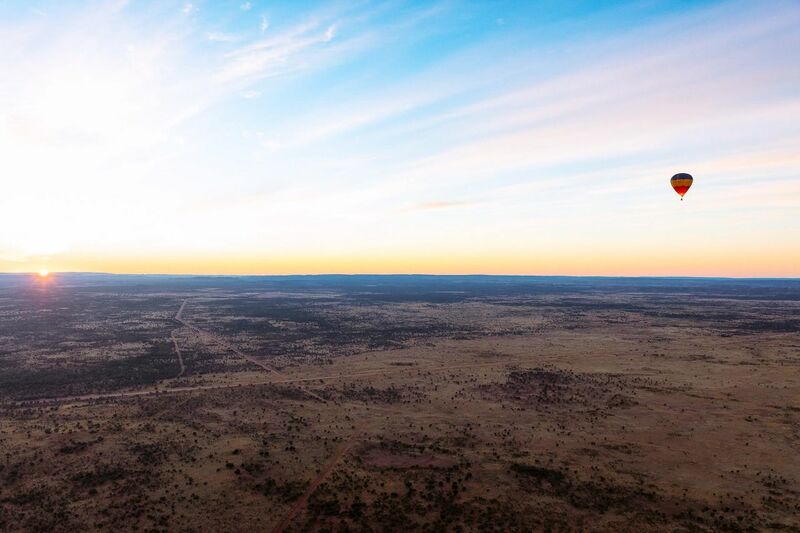 We rose over the West MacDonnell Ranges in the soft morning light and I saw the sheer size of the Outback — and I realized that what I saw was just a fraction of it. The moment the sun crests the horizon and lights up the range is one I will never be able to forget. 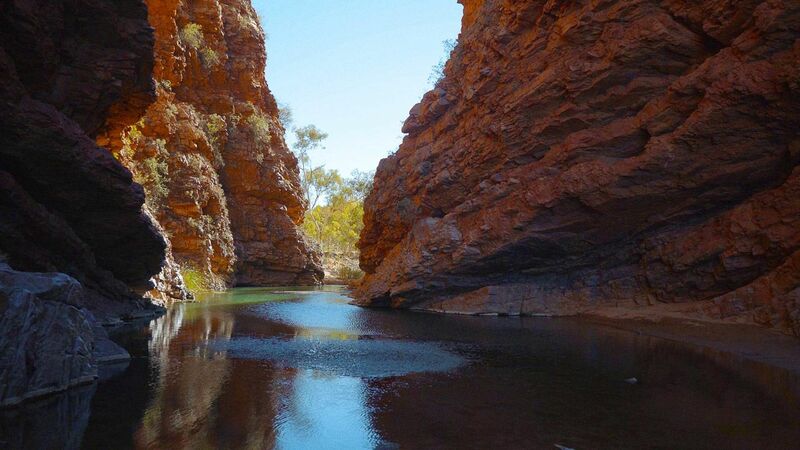 The ranges – which are millions of years old – lie west of Alice Springs and are actually considered a mountain range. They span about 400 miles of ridges, gorges, and gaps, and have a mix of rivers, natural springs, and ochre deposits. Ochre is a key element in Indigenous paintings and art, responsible for a dark mustard yellow color. As the sun lifted higher, we landed and were greeted with pastries and champagne. I wondered why I didn’t start all my mornings like that. I topped up with snacks and coffee and water and headed out to hiking trails in the West MacDonnell Ranges, which are super well maintained and easy to navigate. I experienced gorges, gaps, watering holes, viewpoints, and more. I was able to take in the red walls, rivers, pools of water, and bush at my own pace. My great guide Filippo was from Outback Elite Tours. 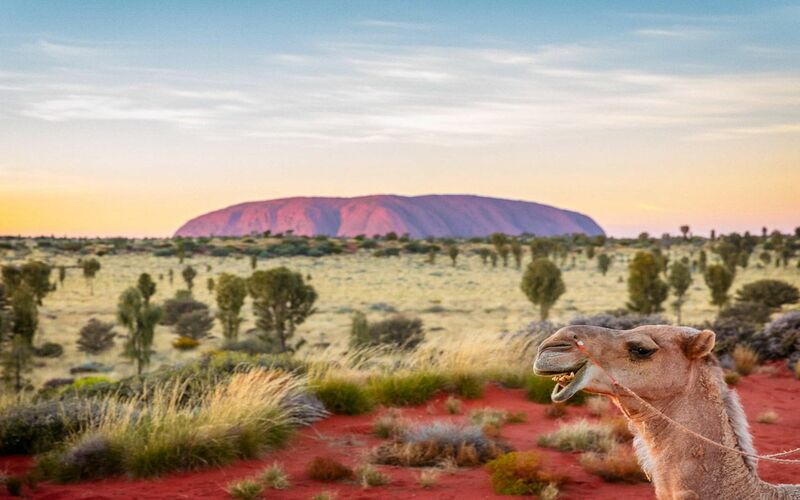 Uluru (once Ayers Rock) is the main attraction in the Red Center. Every crack and crevice in Uluru has a special meaning to the Anangu people – the Indigenous group that has called Uluru home for 35,000 years. They have a story for every feature. 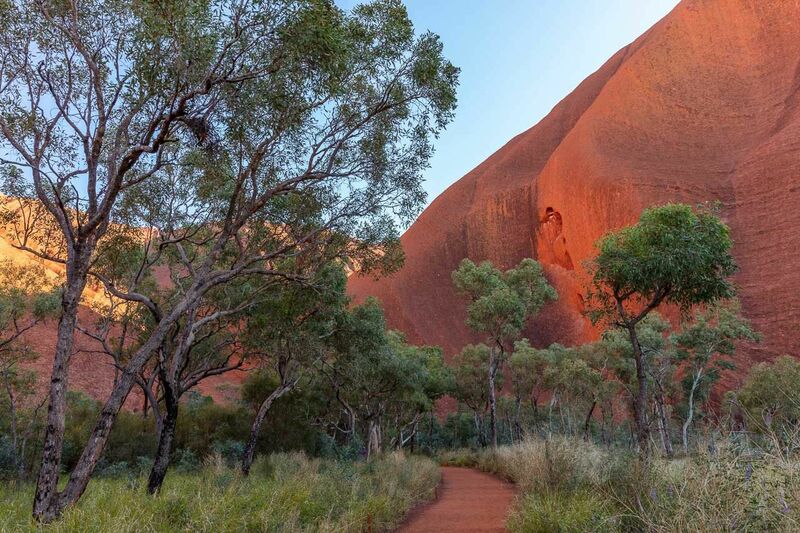 To circumnavigate Uluru requires walking 10 kilometers and takes about three hours. From Alice Springs you can catch a one-hour afternoon flight to Uluru or go by car, but that takes four hours. As the sun changes intensity towards the beginning or end of the day, Uluru begins to turn deeper and deeper shades of orange and red. It seems to flow from within. 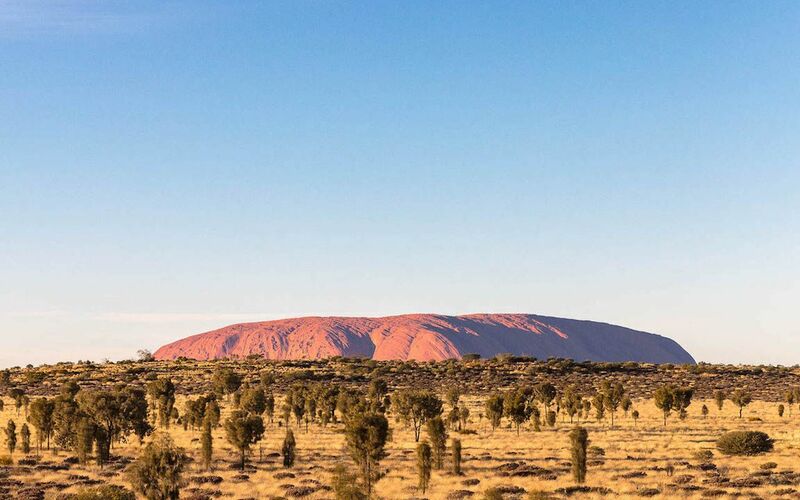 Your guide – strongly recommended for Uluru – will tell you some of the cultural history of the place. 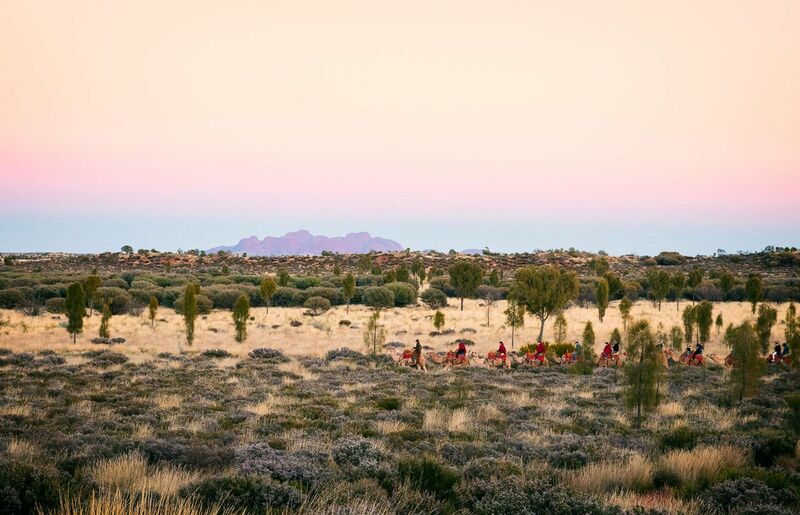 The Anangu people are among the oldest tribes and cultures in the entire world. Their culture is passed down between generations in the oral tradition. The Indigenous have an intense and meaningful connection to the land, the earth, and their history. The visitor can start the day up in the air, and end it traveling by camel. I visited different viewpoints of Uluru, and watched the colors change. 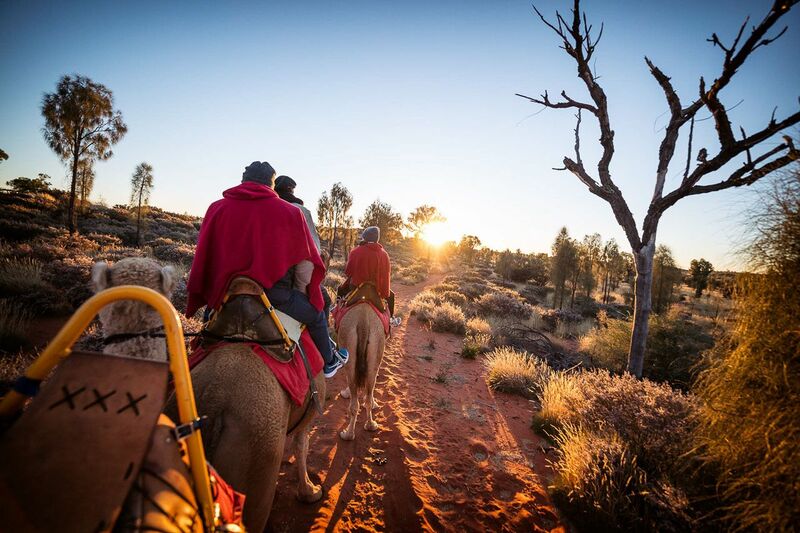 Uluru Camel Tours offer sunrise, sunset, and express camel tours. All are awesome, but sunrise and sunset have the glow – and that dreamy “Is this my real life?” feel. At this time of day, it’s at its prime beauty. That’s my camel, Jonny, photobombing my shot. 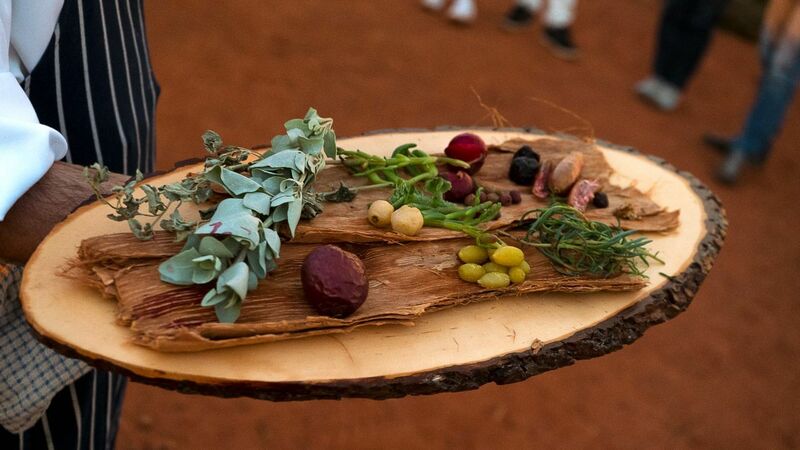 I arrived in time for dinner at the Tali Wiru , which means “beautiful dune.” With the sun setting delicacies were served, all made from local bush ingredients. It was explained how they grow, and their history and importance to the local indigenous tribes. After dinner, I gathered at a fire pit to hear indigenous stories and enjoy a cup of hot cocoa before taking in Bruce Munro’s Field of Light installation . As the sun sets the lights slowly turn on and change color bringing the ground to life below the milky way. 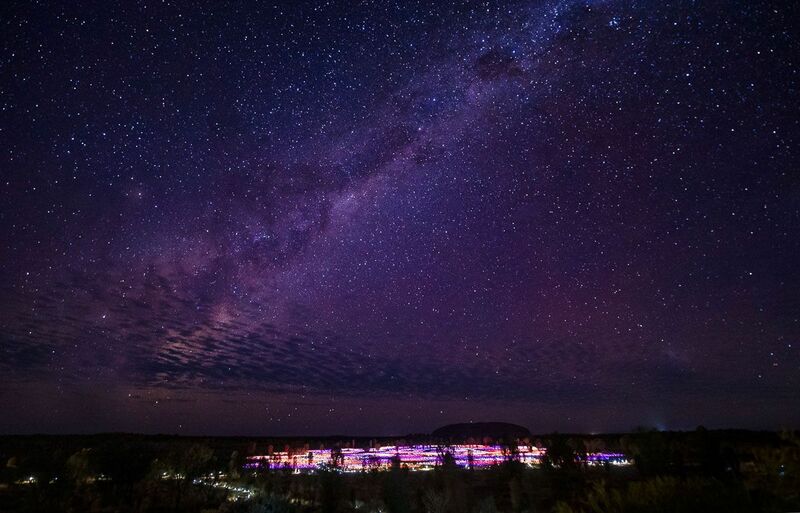 From the hill overlooking the installation, you can even see Uluru. I was in the red heart of Australia – Uluru, in the Outback. I soared, hiked, splashed, flew, explored, rode, saw, ate, and sat back in awe. I lay back, looked at the pure night sky and was grateful for this place.